Today we had lunch with our dear book reading cohort, George, in the charming atmosphere of Tarallucci E Vino. We skipped the pasta, the appetizers, the entrees, and ordered a panini each instead. At $12, that's a pretty nice lunch in a warm and refined setting. 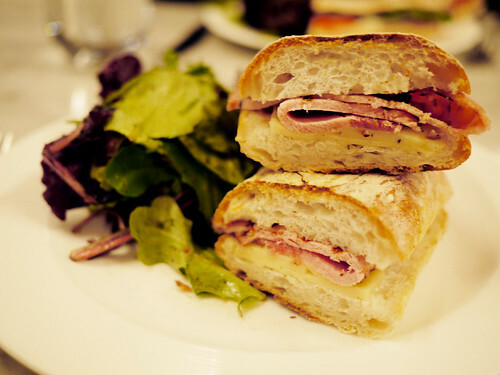 M. quite liked her porchetta though it was more smokey ham than porchetta and George devoured his vegetarian panini. I loved the breseola though it was a bit dry by the end.